Music reminds me that life is a passionate activity and should be experienced as such. A grateful lover of music, Keener attributes much of her spirit and personal growth to it. 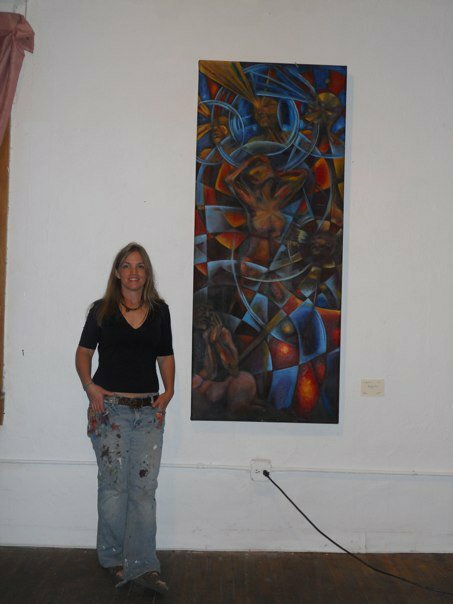 Life became much more vibrant when she began painting the live music scene in Denver. Her artistry Extends to mural work as well including a large 140 ft long group mural on the Sisters of Color United for Education Building, another large mural created with fellow artist Don Callarman on the old (since torn down) Quixote's True Blue and she organized a community mural on a recent trip to Meru, Kenya! Another addition to her repertoire, is in the collaboration of artwork for concert posters with partner Jeff Miller/ Cryptical Development. The pieces they have created, have been chosen by artists such as Widespread Panic, Furthur and Warren Haynes for use on their tours. Her studio work offers a number of styles as well, ranging from fingerpainting to photorealistic to metaphysical. Keener's work can be viewed here on the website, the Cryptical Development website, Quixote's True Blue, Colorado Children's Hospital, ventero open press, The Cliff House , Sancho's Broken Arrow, The Sisters of color United for education building, Facebook and by appointment at Callarman Studios (contact Lauri for appt). If You are interested in purchasing any pieces, please feel free to contact me for info.